Product Lifecycle Management and Master Data Management. I had chance to raise this issue few months ago in my post Will Master Data Management Work for PLM? Few days ago, interesting publication from Gartner about their research in area of MDM and, more specifically, about overlap between MDM and PLM. Andrew White together with Marc Halpern published paper called “Interfacing of PLM and MDM for cross enterprise needs”. The conclusion made by Andrew in his blog article is simple – use a right tool for the right job. In more detailed way, they explained PLM itself as a not mature software category in comparison to ERP, SCM, CRM etc. With lack of maturity and unclear agreed position and usage of MDM, PDM, PLM prevented earlier exploration of intersection between these domains. Now, I’d like to come back to my initial question – how to start right? What is my concern about approach “right tool for right job”? As soon as we speak about corporate and enterprise data and product IP/Knowledge, I think this approach may not work. Today’s enterprise is very siloed, information span across multiple systems – engineering, manufacturing, procurement, supply chain. As soon as a system identify in the particular functional domain, it will not create major conflicts. I see relatively simple approach to position PDM as a system to manage design and engineering data only together with Master Data Management. However, when we come to PLM approach, I see definitely conflict of interest. In my view PLM and MDM strategy has similarity in their approaches to create “single point of truth” in organization. So, what I see as a possible PLM/MDM strategy? I think, MDM strategy and infrastructure, can provide possible foundation for managing of non-transactional data for product development. This data can be accumulated by MDM and saved for future usage. Today’s PLM implementations are mostly focused around product development, so such MDM infrastructure can be good asset PLM can use to achieve long term data retention and other data management needs. At the same time, such approach can bring significant investment into both PLM and MDM systems and probably can be acceptable only by large enterprises. I’m interested in discussion, if you had any experience with MDM and PLM system co-existence. In my opinion, PLM systems are (or at least are designed to be) a specialized MDM system for product information. There is much more to a company that its product information, and PLM is not designed to manage all that. But the intellectual property contained in product information is the true richness of a manufacturing company. 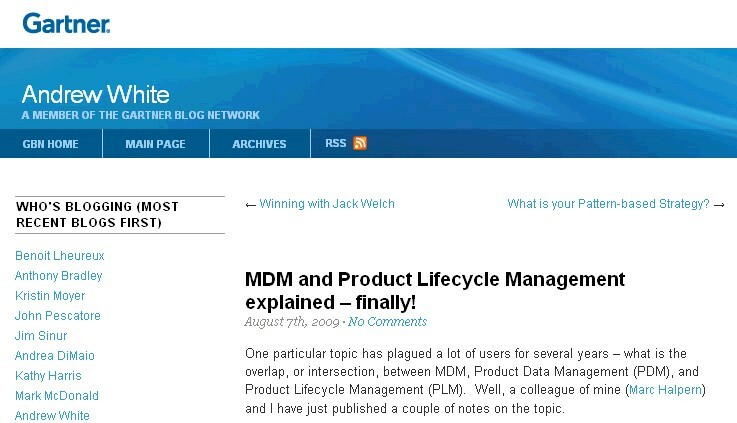 Moreover, PLM is more than a reference database, it is a collaborative process centric environment that guides the development and the evolution of a consistent and quality assured reference set of product information (which evolves rapidly and needs process control to ensure quality of the end result); this process centricity sometimes took the limelight from the purpose of PLM as product information reference base. Nevertheless, product information from PLM is used in many downstream processes: as the maturity of the PLM system grows, so integrations with other systems increase in number and complexity, starting from ERP in Materials management, but not limited to that. This requires an appropriate strategy from the PLM vendors, focused on openness. Openness means providing both the tools to access PLM information (SOA layers, EAI applications …) and a clear strategy to publish this information (available data models, flexible and understood export and import protocols). My take is, the discussion is as fundamental as what is the difference between MDM and Database Management System, than MDM to PLM or ERP. PLM/PDM systems, have one more level of complexity as opposed to storing data and managing business processes/decisions, as compared to transactional systems, and thats of enabling iterations so typical of engineering design, development and sustenance. If one is keen on seeing it this way, they would think of serializing all CAX information and put them in database. to look for in the first month of next year. to use for raffles along with other fundraising events.